The Black Opal from Australia is one of the rarest of Opals. The body color of the gem is usually blue-grey or black, with a contrast of spectral colors. Black Opal is unique to only a few mines in the world, for example the area known as Wallangulla, or “Lightening Ridge“, in New South Wales. Unlike many gem minerals, opal does not have a crystalline structure. It is formed by small spherical particles of silica gel, chemically combined with 6-10% water. It is found as veins in rocks or as “grape shape” masses in cavities of rocks. Opal has a hardness of 5.5 to 6.5 Moh’s scale, placing it in the softer range of gemstones. 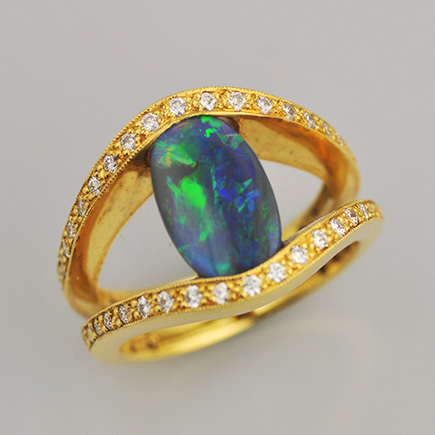 This exquisite 18k yellow gold ring highlights an oval Black Opal weighing 2.09ct. mined in Australia at Lightning Ridge. A dark blue base with vivid flashes of yellow-green-orange and purple fill out the entire gem. The wave motif gold ring shank contains .47ct. of ideal cut round diamonds of high clarity and color, that surround the opal in a semi-bezel style mounting.